The top destinations in The Galapagos Islands are not only popular because of Charles Darwin, but also because they are extremely breath taking. Santa Cruz. It may not be the largest island in the archipelago, but it is the most important. The island has some of the best beaches, such as Tortuga Bay, Punta Estrada Beach, and the Garrapetaro Beach. It is also home to some of the top destinations in the Galapagos Islands, such as the El Chato Tortoise Reserve, where you can see giant tortoises in the wild, and the Charles Darwin Station, where you can get information about the conservation of the Galapagos’d unique biodiversity. Isla Floreana. Isla Floreana is famous for a few things. First and foremost, This island is famous for the Post Office Bay barrel, which has been in use since 1793. While back in the old days, people only take mailings they can personally deliver from the barrel, today, anyone can deliver mail going to someone from their own home country. 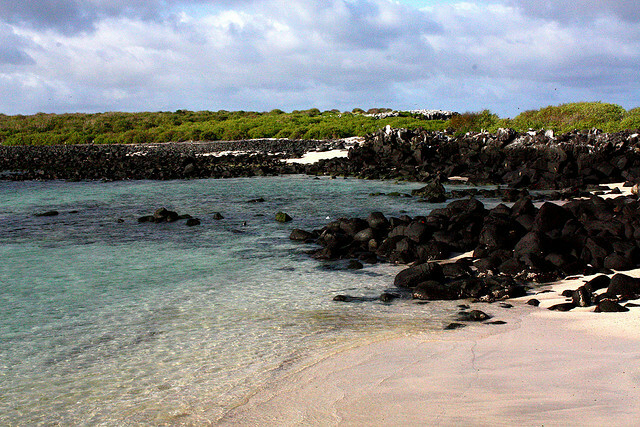 Second, Isla Floreana is famous for Punta Cormorant, where green olivine crystals can be found as well as a trail leading to a view of the saltwater lagoon where flamingos can often be found. Another trail from the lagoon takes you to the “flour beach”, where its white sands are so fine, it feels like walking on flour. Rabida Island. Rabida Island is known for its distinct, red sand beaches and its saltwater lagoons frequented by bachelor sea lions and pink flamingos. The island’s alien landscape is studded with small volcanic craters. Wall of tears. Located in Isabela, this 65 feet stone wall has a tragic history. It was built by prisoners who were forced to build the wall, stone by stone. Many were said to die during its construction. Locals often claim that they could here cries emanating from the wall.